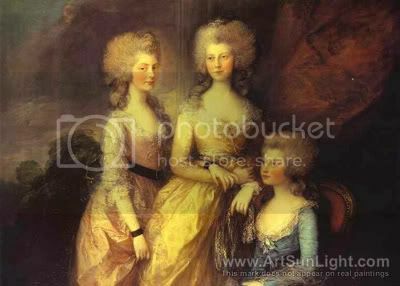 Gainsborough’s work The Three Eldest Princesses from 1784 was commissioned by the Prince of Wales, and shows Princess Charlotte, Augusta, and Elizabeth, the eldest daughters of King George III. Gainsborough uses soft pastel colors, painting the princesses in pink, yellow, and turquoise. The princess in pink has pearls wrapped around her arms, separating her sleeves into puffs, much like the sleeves on the dress of Lady Sheffield, and is wrapped in a sheer shawl shot through with thin stripes of gold. The princess in yellow wears a sash of metallic fabric around her waist, and the princess in blue has golden fringe on her dress as well as gold stripes shot through her sleeves and her shawl. Overall it is a display of the wealth, which reflects on the wealth of the monarchy. The sumptuous and delicate fabrics show that the princesses are true royals- they do not work and can afford the most luxurious and delicate materials. Despite the wealth of the gowns, they are relatively simple in design, the only decoration being very subtle. This reflects on the modesty and good taste of the princesses, as well as represents the English style of dress which often looked down on the excess of French styles. In this painting, the three women are true representations of the proper English woman, and the English monarchy on the whole.